Royal Britain is proud to present a special magazine publication commemorating and celebrating the Diamond Jubilee of Her Majesty Queen Elizabeth II. The Diamond Jubilee marks Queen Elizabeth’s 60 years on the throne, making her only the second British monarch in history – other than Queen Victoria – to achieve such a milestone, which will be marked with worldwide celebrations. 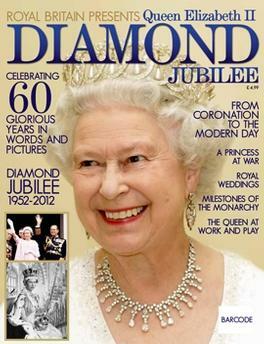 In fascinating words and picture, Royal Britain’s Diamond Jubilee magazine looks at the life of this very modern Queen from her birth in 1926 through to the present day (attending 2011’s marriage of her grandson Prince William to Catherine Middleton at Westminster Abbey), chronicling the many stages of an often-turbulent existence lived mainly in the public eye. Be the first person to tell us what you think about Royal Britain Presents Queen Elizabeth II Diamond Jubilee and you'll save £2.50 on your next purchase!